The Great Dictator is a comedy film directed by and starring Charlie Chaplin. 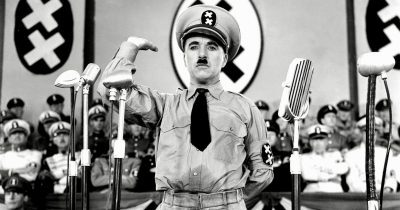 First released in October 1940, it was Chaplin’s first true talking picture, and more importantly was the only major film of its period to bitterly satirize Nazism and Adolf Hitler. In the film Chaplin plays two characters who look strikingly similar- a Jewish barber and a dictator who looks like Adolf Hitler. Near the end of the film, after a series of far-flung mishaps, the dictator gets replaced by his look-alike, the barber, and is taken to the capital where he is asked to give a speech. Greed has poisoned men’s souls, has barricaded the world with hate, has goose-stepped us into misery and bloodshed…. More than machinery we need humanity. More than cleverness we need kindness and gentleness. Without these qualities, life will be violent and all will be lost… …. Let us fight to free the world – to do away with national barriers – to do away with greed, with hate and intolerance.